Funnily enough, it was in Barcelona that I first discovered the joys of Moroccan food, so I thought I’d have a go myself. This is based on a great recipe on The Daring Gourmet, but with a few changes. It’s really lovely, so try it! First, prepare the marinade. It’s simple really, just chop it all and chuck the chicken in. If it doesn’t seem to be coating the chicken properly, a little more olive oil is never a bad thing. 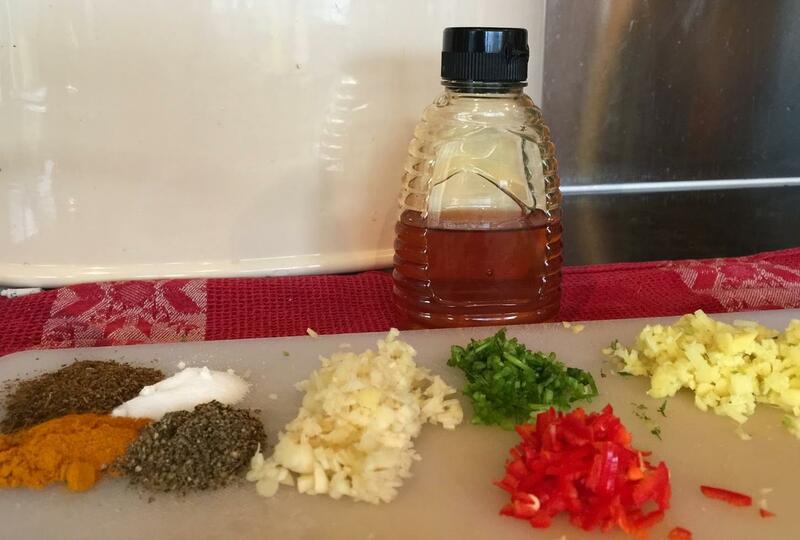 — I decided that a chilli would give it a nice warmth, and also adding honey and lemon juice meant that the marinade was a bit more liquid, as it seemed a bit thick otherwise. Before you put the marinade the on to the chicken, it’s a good idea to score it, this will mean that the marinade soaks in really well. Leave this for as long as you can, a marinade will work better the longer you leave it, at least 2 hours will do though. Now it’s time to get cooking. Heat a good tablespoon of oil at a low to medium temperature, then fry an onion in with a sliced garlic clove, until the onion is softened up and translucent. Once this is done (probably about 5-10 minutes in), add the chicken and the marinade. When the chicken’s white on one side, fry the other until the whole breast looks cooked. Sealed chicken, made yellow by the marinade. Remember, though, you’re not aiming to cook the whole breast, you’re just sealing it, as they say. — Once you’ve got to this point, put in your chicken stock. I always prepare the stock in the bowl I marinaded the chicken in, to get any extra flavour. — Let it cook for around half an hour on a medium heat, keep turning the chicken as it cooks, and don’t let the stock over-boil. Now’s the time you get to prepare all of the most lovely ingredients (no offence, raw chicken). The first thing to add out of these great flavours are the olives. These can cook for longer than the other ingredients here and it’s nice when they soften up a bit. — With that in mind, about another half an hour’s cooking is needed before you add the preserved lemons. — Cook the lemons for about 10 minutes. You only really want to use the skin of the lemons, which should be rinsed off to get rid of excess salt. 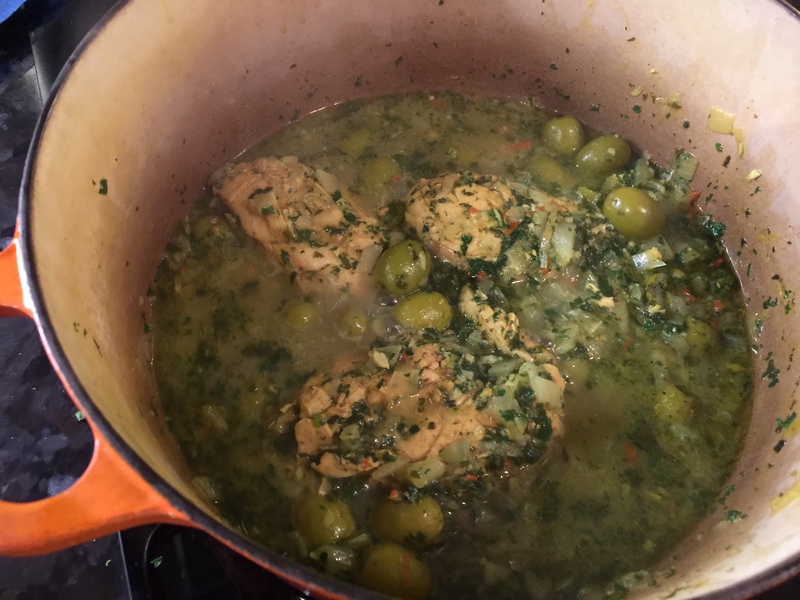 — Now throw in all those lovely fresh herbs, as well as the fresh juice of two slices of lemon, then simmer it down for a little while, until it starts to thicken up. A good guide is for the chicken to look well coated in the sauce when you lift it out of the pot. You don’t want it as thick as curry, more of a thick soup’y consistency. I like to serve the rice in a heated bowl, and the chicken and sauce in another bowl. This way you can mix as you go, and have it as strong as you want. Now it’s time for all of your friends/family members to say ‘is it a tagine?’. You can say ‘no, it’s a Djej Makalli, actually’. If this is your first time on Jack’s Grub, be sure to check out my signature recipe – an Italian-styled pasta sauce which has taken literally years to perfect!